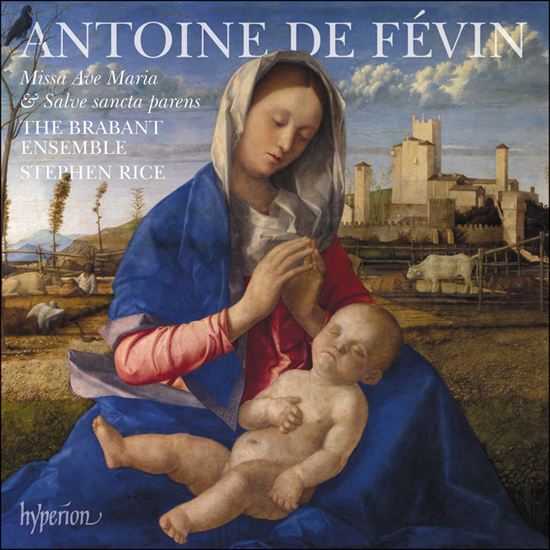 Antoine de Févin (c1470-1511/12) is a relatively unknown composer of the Renaissance Franco-Flemish period He was born around 20 years after Josquin des Prez, but died about 10 years before him. For the past few years of his life, he worked in the Chapelle Royale of Louis XII of France, who apparently thought highly several chansons. His compositional style is similar to Josquin’s, who he admired. The opening Missa Ave Maria is based on Josquin’s well-known Ave Maria. His contrapuntal writing is not as strict as some of his Renaissance contemporaries. He clearly enjoys contrasting homophonic and contrapuntal passages and freely switches from one to the other. There are several magical moments, one of the finest between the Agnus II of the Missa Ave Maria where two outstanding high voices (Kate Ashby and Claire Eadington) weaves threads between themselves. The second Mass, the Missa Salve sancta parens, is rather more complex. It includes some delightful rhythmic complexity in the second Kyrie. The singing of the two Masses is relatively restrained, but the powerful Ascendens Christus in altum Responsory is given a far more powerful performance, with its jubilant Alleluias and confident O rex gloriae. The stratospheric sopranos are particularly impressive in this piece. The twelve singers (not all singing in all tracks) of the Brabant Ensemble produce an admirably cohesive sound. It was recorded in All Saints’ Church, East Finchley, North London. The choir initially sound a little distant, which takes a little while to get used to. There is a link to the comprehensive CD booklet here. Whether you sit back and let music like this just waft over you (which, in my view, is perfectly acceptable) or whether you are the analytical type, this exquisite recording reveals a composer of considerable merit.